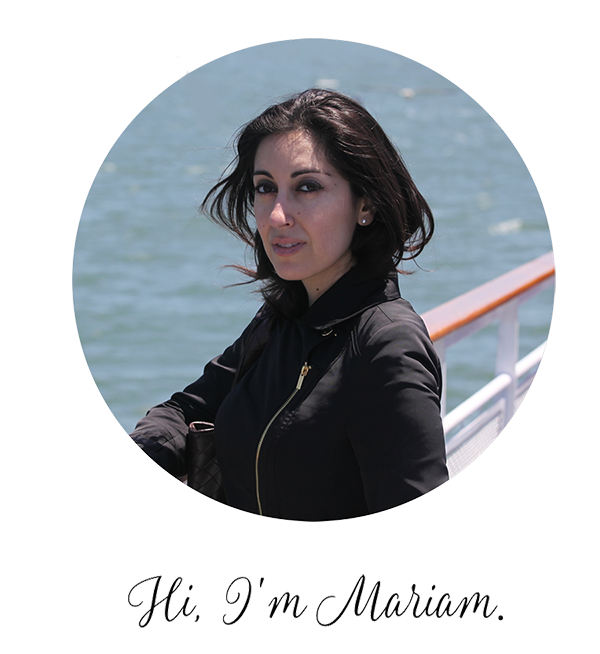 We’d spent the first four days of our vacation making day trips around the island, so on our fifth day, Nishan and I stayed close to home. After a hearty breakfast at Living Foods Market in Koloa, we made the five-minute drive to nearby Allerton Garden. 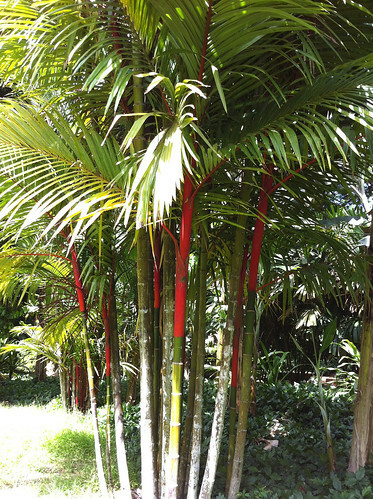 Allerton Garden is one of the United States’ five National Tropical Botanical Gardens. All but one are in Hawaii and one is in Florida. Queen Emma of Hawaii formerly resided at Allerton Gardens and in the 19th century, it was purchased by the McBryde family until it changed hands again in the 1930s, this time by Robert Allerton. Allerton designed the landscape into a series of individual gardens, and today the grounds maintain much of its original roots. But enough about that. 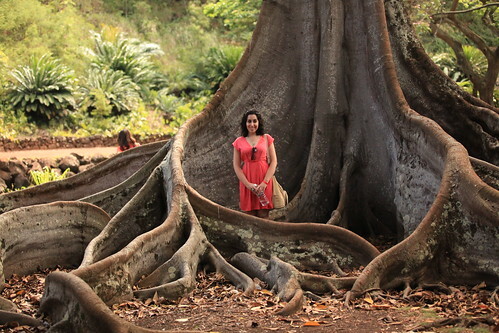 These gardens contain the larger-than-life Moreton fig trees that were featured in Jurassic Park. I got a kick out of realizing that the trees’ roots are, in fact, taller than me. Giant trees! So cool. 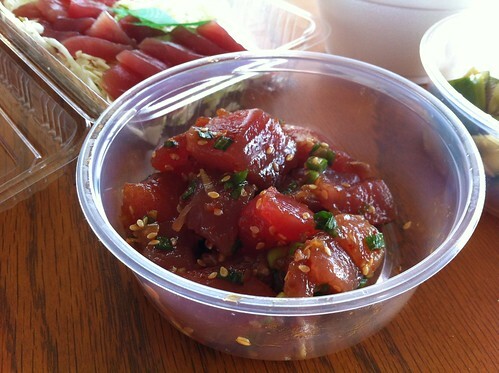 After our lazy day at the garden, we stopped at Koloa Fish Market on our way back to the condo to pick up some tuna sashimi, tuna poke, and cucumber salad for dinner. What’s better than a meal of fresh fish while you take in a stunning view of the Pacific? Our sixth (and last day) in Kauai was just as lazy. 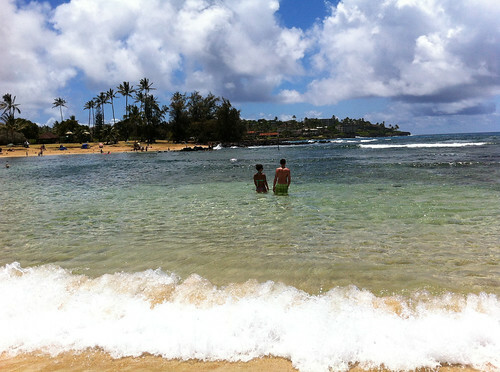 After another breakfast at Living Foods Market, we made another five-minute drive to Poipu Beach. 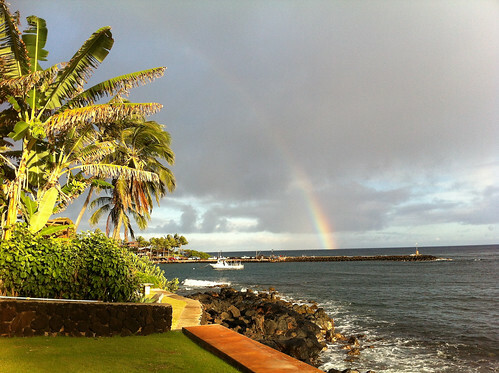 Poipu Beach is one of the island’s most popular beaches, both for its clear blue waters and its calm surf. Calm enough for a rookie like me, even. 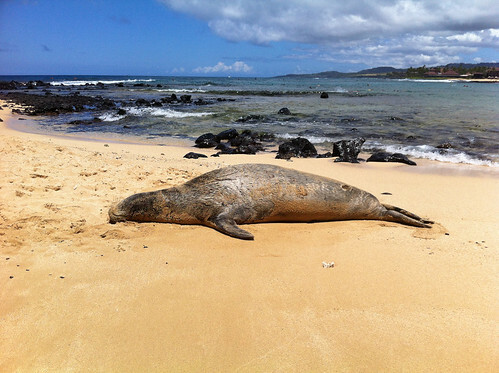 The beach is popular with non-human visitors, too. 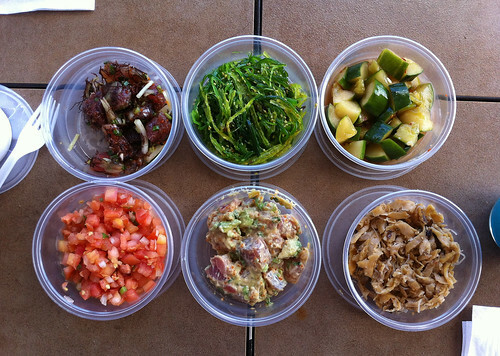 After Poipu Beach, we stopped at Koloa Fish Market for another meal of assorted poke, because, really, is there ever such a thing as too much poke? Probably not. We spent our last evening relaxing in the back yard of our rented condo, taking photos and snacking on arare. A sunshower left us with a huge rainbow as the sun was setting and just like that, the day was over. Too bad I couldn’t bring some poke back with the mainland but until next time, I can always recreate the flavors of Kauai in my kitchen. That tree is amazing and makes you look like Thumbelina or the fairies from Fern Gully. Cindy, there was a whole row of these trees! Unreal.